Cleaning your windows consumes a too much time and efforts? You can do something different now – simply get in touch with our representatives and request our window cleaning in Noel Park. We will manage this chore for you and the final result will be perfect for all parts of your windows – glass surfaces, frames and ledges. With our help, you will have the opportunity to do anything you desire with the time you usually spend for window cleaning. And our services will bring you even more, as you can witness from our list of benefits. We also provide our professional services in nearby areas: Alexandra Park, Alexandra Palace, Wood Green, Hornsey, Hornsey Vale. You can count on the cleaners for both household and business window cleaning. Every kind of glass surfaces are included in our professional routine. For instance, you can get a service for cleaning small or double windows, sash ones, French doors, bay windows and patio doors. Besides these, we wipe and polish garden window surfaces, conservatories and skylights. At home or at the office, you can always ensure crystal clear glass – just call us! We have the skills and the right methods for the assignment. 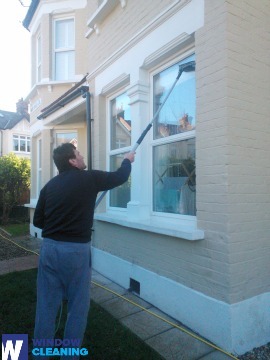 We provide domestic and commercial window cleaning by using sophisticated approach. You can rely on our skills for all types of glass surfaces, skylights and greenhouses. For windows placed up to the fourth floor, we use water-fed extension poles. This technique is comfortable and allows risk-free cleaning process – the poles are attached to the water reservoir in the vehicle. For high-rise windows, our rope access team will grant you quick and great end results. You can gain a lot from these techniques right now – just ring 020 3746 3113 and book a window cleaner! You will have perfectly looking work environment with the help of the experts of commercial window cleaning. You can depend on our first-rate services for all kinds of business premises. If you have a small shop, we can thoroughly wash its windows by using our water fed extension pole equipment – it gives us the chance to reach up to the fourth floor. If you search for pristine look for the glass panes of a tall business property in London and the neighbouring areas, we will make use of our rope access gear. In any case, you will appreciate superb results in no time. You will see your absolutely clean home after the expert window cleaners in Noel Park visit you. We deliver great services for the entire London area. The most modern ways of cleaning are included in our working practice – including water-fed extension pole system and and jet washing. You will see for sure the change of your home's entire look – we use purified water for the process of inside and out window cleaning. Give us a call today on 020 3746 3113. Our customer agents will guide you and answer all of your inquiries. Furthermore, you can use our on-site booking from.